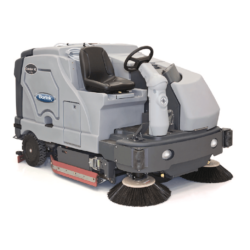 The Advance Condor 4030C Rider model is a battery-powered riding sweeper/scrubber machine. This unit provides a 48” wide cleaning path. 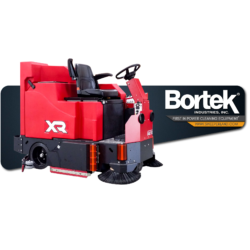 You can achieve cleaning productivity of over 50,000 square feet per hour with this machine. The Condor 4030’s side-brooms consolidate any debris in your path into the maw of the cylindrical brushes. Those brushes will scrub the floor and reach into grout lines or spacers while tossing any debris in your path into the on-board hopper. A curved vacuum squeegee retrieves dirty solution and wipes the floor clean. The Condor 4030’s high speed scrub deck runs the cylindrical brushes at 600 RPM. Both brushes are pressed to the floor with multiple pressure settings so you’re able to customize your machine’s performance for its environment. • The large 70 gallon capacity tanks provide a greater coverage rate per hour than the coverage rate available with many competing manufacturers. Fewer stops for solution replacement means more productive time cleaning the floor. – Water Only Perfect for removing surface dirt and maintaining the clean look of floors. Water-only mode eliminates the impact of detergents on the environment and reduces cleaning costs. – Ultra-low Detergent Well suited for routine cleaning where a small amount of green certified detergent will do the trick. Water and detergent are dispensed separately at the scrub deck, eliminating solution waste. – Standard Detergent The tough cleaning you expect. At standard detergent, pad pressure and flow rate, you’ll have a combination powerful enough to pull stubborn dirt, grease, and oil from surfaces. – Burst of Power For deep, restorative cleaning or unexpected challenges. EcoFlex’s burst of power temporarily increases your machine’s pad pressure, detergent use and flow rate at the touch of a button. • A “smart” controller that automatically matches on board water use with brush pressure levels. This is designed to minimize and control overall water usage and limit waste water treatment requirements. • Features a green “GO” button for totally automatic operation Ease of use is a factor in all equipment selection. The featured “touch pad” control system provides simple one touch operation. Its’ intuitive display makes training a new operator a snap. 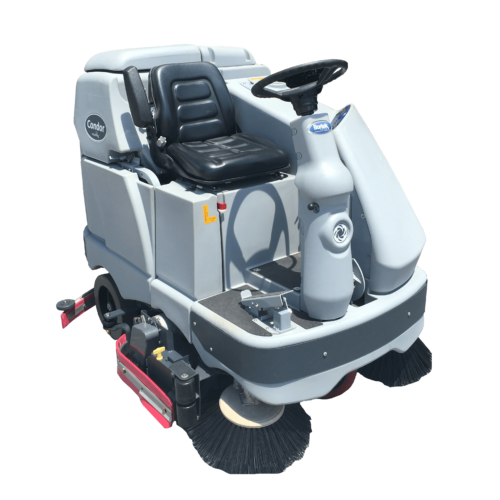 Similar designs are seen on all the Advance industrial rider and walk behind scrubbers making them the easiest to use cleaning machines in the marketplace. 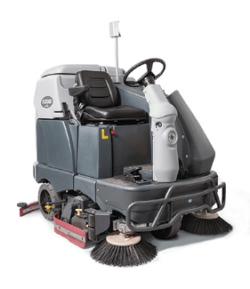 • This scrubber also features a comfortable seat with an adjustable steering wheel. The solution flow, the scrub brushes, and the vacuum shut off when the machine has stopped, thus protecting your floor and products in the surrounding area from brush marks and uncontrolled solution feed. The Condor offers outstanding maneuverability and unmatched operator control. Contact us today!